HomeFriends of MotherlodeGiveaway: A NEW WASHER AND DRYER FROM METRO APPLIANCES!! Giveaway: A NEW WASHER AND DRYER FROM METRO APPLIANCES!! Spring has officially sprung, which means it’s time for us to spring our BIGGEST giveaway of the year on you — a brand spankin’ new Frigidaire front-loading washer and dryer on pedestal stands from Metro Appliances & More in Springdale!! TimeWise: Wash time equals dry time – so you don’t wait for clothes to dry. Energy Saver Option: Further reduces energy use up to 60%. WashSense Technology: WashSense technology ensures clothes get clean with care. Express-Select Controls: Easily select options and cycles with the touch of a button. Add-a-Garment: With just the touch of a button, easily add an extra piece to the washer once a cycle has started. Save Your Settings: Automatically save your last wash setting so you can save time when doing laundry. Delay Start: Set your washer to begin washing on your schedule. It can be programmed from 1 to 14 hours. 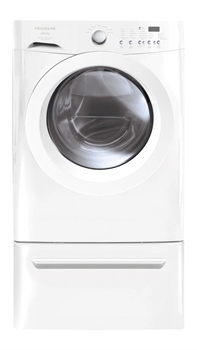 Ultra-Capacity Dryer: The largest in its class, so you can finish more laundry, even faster. NSF Certification: Dryer includes ‘Sanitize’ temperature settings to ensure your laundry will be 99.9% bacteria free. 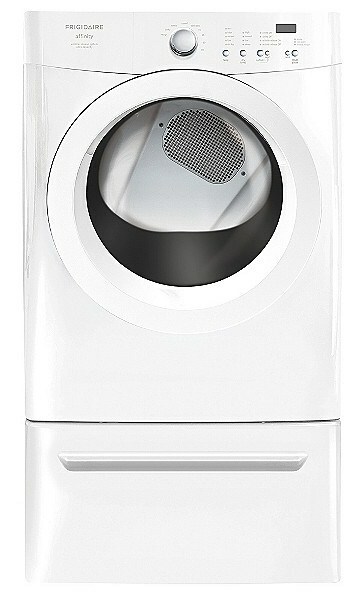 Fits-More Dryer: The largest capacity dryer in a standard size lets you dry more at once. TimeWise Technology: With TimeWise technology, wash time equals dry time – so you don’t wait for clothes to dry. Save Your Settings: Automatically saves your last dry setting so you can save time when doing laundry. If you’ve been a Motherlode reader for a while now, you’ll know that the Metro Appliances washer and dryer giveaway has taken on a life of its own in recent years. This is the third time we’ve had the opportunity to host such a BIG giveaway, and it’s so much fun to contact the lucky mama with this kind of good news. HOW TO ENTER: If you’d like a chance to win the new washer and dryer set on pedestal stands, just click the big orange comment button below and tell us what you like about shopping at Metro Appliances & More. If you haven’t been there yet, then you can enter by posting a comment on your best “Spring Cleaning” tip since it is that time of year. You can also email your comments to us at giveaways@nwaMotherlode.com. If you’re new to the area or haven’t shopped at Metro before, we hope you’ll go by and check it out. There is a reason why they’re so popular with local women. The Metro showroom is HUGE, and it’s full of salespeople who know what they’re talking about yet they don’t make you feel pressured to buy. Also, Metro is the only appliance store we know of that gives local mothers a chance to win a set like this for FREE. 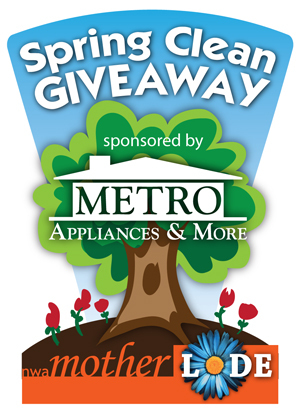 STAY TUNED: There will be a new twist to this year’s Spring Clean giveaway with Metro Appliances, so keep a close watch on the homepage so you’ll know about it. We’ll be posting updates to the giveaway within the coming two weeks. Good luck, and start posting your comments!! Spring Clean Giveaway: Win a new washer and dryer!!! Metro is changing its name! Who Won the Washer & Dryer from Metro? Read on! Have used Metro for appliances on last two houses. Alway customer service first. Thank you for sticking around NWA! I learned this by doing it when I was a child -when you need to shine hardwood floors, give your child a cloth big enough to sit on and have him/her scoot all over the floor! Fun and nice shiny floors! The soap diluted lasts for ages, and it works SO well on stubborn stains. I once got half-dry house paint out of carpet with no problem. Smells wonderful too!! NWAMotherlode has the best giveaways! My best tip for spring cleaning is to get some help from a friend who is good at organizing. When you see all of the things she is pulling out of the back of your linen closet and from under your bathroom sink, you’ll be inspired to toss, toss, toss! I don’t have a spring cleaning tip, but I just love when the weather gets nice enough to open all the windows and air out the house while I do a complete cleaning! I do have to do my own laundry though, so I would LOVE LOVE LOVE to win this! Get the kids involved! My 3 year-old is much closer to the ground than I am and actually wants to help. So I give him a damp rag and let him wipe the baseboards. Of course he doesn’t do it as well as I would, but being 36 weeks pregnant, it’s a huge help and he learns to clean. My best laundry tip is to always check pockets, even if they are on the 3 year olds jeans. Dad is not real happy about the white kleenex fuzz everywhere. I have not shopped at Metro, but will when I need to replace any of my appliances! My spring cleaning tip…get someone else to do it? that’s what I wish I could do! Make cleaning fun by turning on some music and dance while you clean! Also be sure to donate what is worth donating so it can bring someone else joy! Also we make piles of clothes and toys into a giving pile to give to friends that can use them. I love the selection Metro Builders Supply has. The staff is always very helpful and full of knowledge. Spring cleaning tip: Do a little cleaning each day. My best spring cleaning tip is to declutter as much as possible. It really makes a difference just getting rid of some of the unused junk. My best spring cleaning tip it to tackle it room by room. Instead of cleaning all the windows, then all the floors, I like to clean one whole room. Then, it doesn’t seem like such a daunting task. I just looked at these on Saturday – they are fabulous! My decade old relics are ready to be put down and these would be great replacement!! My spring cleaning tip – REPAINT! Spring is a time for change and I love to paint so I try to repaint the whole house. It gives everything a pick me up!! When I am in a hurry or want to get the shower cleaning over with, I clean my shower while taking a shower using cleaners with caution of course. I can get two things done at once and I don’t get water all over the floor and all over my clothes. I like shopping at Metro because of how friendly and helpful everyone is. Spring is on of my favorite times of year! I actually enjoy spring cleaning because I can open the windows and let the fresh air in! One tip is “baking soda”! I use it for everything 🙂 it is not as harsh as some chemicals and gets counters/bathtubs super white! Also, put some in a seal-able container, add a few drops of essential oils, close it up for a few hours, and viola, you have carpet sprinkle! Best tip ever is if you see it dirty now clean it now! Saves time later when your ” spring” cleaning. My best tip is just not to get overwhelmed about thinking of spring cleaning as such a big job! Just do one closet, one window, as you have time. Even a little at a time is better than feeling overwhelmed and doing nothing. I haven’t been to Metro yet, but a spring cleaning tip would be to sort through toys and rotate them every three to four months. I use the rubbermaid tubs with a dry erase area on the outside so that I can change the months for rotation if needed. Don’t forget the top of your cabinets when you spring clean! I have shopped at Metro Appliance several times. I really enjoy the variety of models and cost ranges to choose from. I really appreciate the low water washing machines because we are on a well and septic tank. While it is not a spring only thing, I actually make my own laundry detergent! I make it in 5 gallon buckets and it lasts forever and works great! Just Google homemade laundry detergent for recipes! Here is to some fun spring cleaning and with open windows! I don’t have a tip. Just that I love it when my house is spring cleaned. 🙂 I love to open up the windows and let the fresh air blow through. Cleaning the curtains and blinds make things fresh and new! I am just about finished with a “40 bags in 40 days’ project. A friend gave me the idea. I take an empty plastic shopping bag and fill it up with stuff we no longer need/use. As soon as it is full I put it outside the door to go to charity. Some days I fill several bags and some days I might just fill one. I have gotten rid of 37 bags of clutter so far. Only 3 more to go. Its amazing how much I have gotten rid of and ,honestly, I can barely tell a difference. I may need to do another 40! It blesses me and my family with a cleaner house and it blesses others since the stuff goes to charity. Happy Spring! My best spring cleaning tip is to select one room at a time (and have a time limit). Make 3 piles: Keep, trash and donate/garage sale. Turn on some music, set your timer and go to work! I find that we fill the amount of time we have, but miraculously when we only have an hour before company arrives we can get so much done because we have that sense of urgency so setting a timer helps me focus. went with my mom to metro when her and my dad built their new home. she bought a counter depth fridge there. i had never even heard of one and it is so cool! although the icemaker quit after only 2 years, it’s still a good refridgerator. I love shopping at Metro because they have everything one would ever need. I also like to day dream there. My favorite spring cleaning tip is opening up the windows for the “fresh air.” It seems to clean out the stuffy, firewood smell of my house. Best spring cleaning tip: Open all the windows & put the dog outside. SPRING ~ open up the house and get the kids involved! Metro is a great place to purchase your appliances. We have purchased from them personally and for our church and saved money. Yeah! My Spring cleaning tip…VINEGAR. I clean everything with vinegar..it gets rid of odors, it’s anti bacterial and it’s safe! Not to mention it’s CHEAP! plant some flowers near the front door…they look so cheerful, no one notices if all is not perfect indoors! I Love Metros competitive pricing coupled with brand names and styles! I LOVE Metro Appliances. We recently got a dishwasher there. They helped us find the best machine for our budget. My parents bought all the appliances for their new kitchen there. They are very honest and helpful–also the best prices. We used Metro when we built our first house. They were very helpful and we will definately go back! My best Spring cleaning tip is to send your child to grandma & grandpa’s house for the day, make plans for your husband to be gone, make a list of everything you want to get done, crank up the music, and clean till you’re done! I would LOVE, LOVE, LOVE to win this giveaway! I’m in bad need of a new washer and dryer and these would be perfect!! I just love Springtime weather because when you get to do Spring cleaning you can open the windows but the best part is washing all your sheets and getting to hang them outside and saving energy! I still love the dryer though! Since 1993, we’ve always shopped for appliances at Metro. They’ve got the best selection, the best prices and are always willing to help us get the best appliance for our tight budget. I’d gladly pay my old set (from Metro) forward for a new set!! Spring cleaning tip: Use a chamois rag to clean your windows and a good towel to dry them inside and out. It is alot easier and quicker then Windex. With no streaking!! And the best part is you don’t have to keep buying supplies over and over. This washer and dryer set would be such a blessing to my family. We have 5 children and my washer is broke and my dryer has started making a weird noise. Worst of all my husband is out of work. Thank you for the opportunity of possibly wining this. Spring Cleaning…BLAH. Do it early while it is still cool and then you have it done when the beautiful weather gets here. Then you can spend more time with your family doing FUN things! My best spring cleaning…hmmm…take it one thing at a time and go through everything. Every closet every room. It feels and looks so good when it is done! I have never shopped at Metro, but knowing they are supporting a great site in this giveaway is never far from my consumer brain! I will certainly remember them when I go to buy any new appliance! My spring cleaning tip is….Throw it out! It feels good and we don’t need half of the stuff we have! My best spring cleaning tip is to set a time for 15 mins and clean clean clean! You will be amazed what you can get done in jut a few mins!! Metro has such a huge selection of appliances. Spring Cleaning tip…..Let the Sunshine in!!!! I have not had the pleasure of shopping at Metro but am so pleased they are part of this give away. As for spring cleaning tips I like the idea of making it fun, lot’s of good music to clean to and lots of help from the family. We are always trying to pare stuff down and donate and or sell what we do not need.I just love spring, open windows and lots of sunshine just make my day. Those busy people at Metro really know about the products they sell, and they will take the time you need to make the wisest choice, plus you may just get in on one of their major sales and really save. We recently shopped there for a dishwasher, and we are so pleased with our purchase. I love how knowledgeable the employees are at Metro. They helped me pick out a dishwasher that was just right for me and my family. Spring Cleaning tip is to wash all your curtains – get the dust out! My spring cleaning tip is…start with the windows first..let the sun in!!!! I like their competitive prices! I enjoy shopping at Metro because the salespeople are knowledgeable about their products and the location is convenient. I also love that they sponsor this giveaway each year! My Spring Cleaning tip is to get the kids involved! Mine are 2 and 4, and they love to sweep, dust, and vacuum. Any help is welcomed and it keeps them busy! 4. My 17 year old dryer just died last week!! My best spring cleaning tip–set aside an entire day and get it done at once! I would LOVE to have a new washer and dryer. My best spring cleaning tip is really my best overall keeping-the-house-clean tip – and that is flylady.net! There is no way I’d be able to stay on top of things without her help and guidance, check it out! I need a new washer & dryer! Ours is a really old hand-me-down from my mother-in-law! It came complete with old dog hair!! Cleaning tip: Purge all the stuff you have not used in the last year. My Spring cleaning is to completely empty closets and then only return what I’ll actually use. Everything else goes. Start with an empty pallet. Spring cleaning tip… Wish i have them. Guess to get eveyone in the house to help you and then offer a dinner out as a reward. Sure could use a new washer and dryer. Ours are about 15 years old and we do so much laundry because our 3 grand daughters are almost living with us. I forgot a tip: use plain water to wash your bathroom mirrors and dry with a dry paper towel. It doesn’t streak! Iearned it from Oprah! When doing a quick pick up grab a laundry basket and start grabbing & walking, pick things up and carry multiple things instead of making several trips to each room, helpful with all the little toys. Every experience I’ve had with Metro has been pleasant. Great customer service and prices! My best Spring cleaning tip – find a good check-list and work from it! Metro is a great place to shop for your appliance needs. Great Sales staff. I can’t say that I have had the privilege to shop at Metro, but WOW, would I like too!!! Best thing for cleaning is to use a product called AWESOME!…it’s every bit of its name and can be used on everything in your house, even for shampooing the carpets and there are no harsh chemicals. Metro has the best selection and prices on all their applicances! My tip is to break your cleaning up and do a little every day. If I wait until I have an entire day to clean, it won’t happen! I first became familiar while living in Tulsa. My dad was a commercial general contractor and he suggested I visit their showroom. VERY nice and informed salespeople. You have quality stuff and are very patient in explaining the features of your appliances. Spring cleaning tip — wash all of the quilts/blankets used during the winter. They will be fresh for the next year. I like to tackle spring cleaning by sorting through items I haven’t touched since last spring! If I haven’t used it in a year… It’s going in the garage sale! Helps so much with clutter. Don’t forget the fridge and the medicine cabinets. I always look for anything that might be outdated and get rid of it. 4. I also have a 17 year old son living at home also. You can only imagine the amount of laundry we have each week. A new washer and dryer would be the AMERICAN DREAM. 1. Trash…box up and throw away any trash or items that are broken, ruined. The kids can really help with this as they know all the broken toys! 2. Give away or sell…box anything that you don’t use much that still has much life in it. Consider blessing someone else that may need it. 3. Storage…box items that you won’t get rid of but you hardly use them. 4. Put away…things that are used often, but make sure that they all have a place to go! My husband and I visited Metro a few years ago to pick out appliances for our home that was being built at the time. Loved the large selection and friendly staff. Will definitely return when we are ready to make our next purchase! Cleaning tip: Start in one room and work your way around the house. Empty closets, drawers, every nook and cranny. Try to toss stuff when the kiddos aren’t around, that way they won’t even know what they’re missing! We try to make Spring cleaning fun! We open the windows, play some music, and get the whole family involved! We have “contests” to see who can complete a task first. I have shopped at Metro, it was 7 years ago when we bulit our home. I bought EVERY appliance in my house from them. They are very nice people! I would love to have this new set!! I have 3 children and a husband, we live on a farm and get really dirty, so therefore mom has lots and lots of laundry to do daily!!! !This would be a GREAT BLESSING for our home. Spring cleaning tip: I LOVE the Magic Eraser products, especially the ones for the bathroom! Metro has a great number of selections…I love searching all the different items they have for sale. I especially love the stackable hg washer and dryers …. My tip is crank up the music and drink a Redbull! I desperately need those cleaning machines! Spring cleaning tip: organization is your best friend!! I would love to win this new washer and dryer set! I have never shopped at Metro before but would love to go soon. We are in need of a new washer/dryer set! If I give my girls wet wipes or swifter dusters they love to help me dust and clean stuff around the house! I haven’t been to Metro yet, but I’ve heard great things about them. Including, best prices and inventory in the area. We would LOVE to win this new set, it would be much needed as ours are on the fritz. Best Spring Cleaning Tip: Open the windows, makes cleaning more enjoyable! know their business! I live alone and struggle with finances so can always use a good appliance! I love Metro! Their sales staff is extremely knowledgeable about their appliances and have been happy to help both times I have purchased from there. My spring cleaning tip is to purge toys when your children are sleeping or away from the home. I do this often and it helps with clutter and we don’t get overwhelmed with toys we no longer play with. Every spring I clean out my kids closets & drawers. I get rid of anything that doesn’t fit them anymore or is worn out. I just got it all done over spring break!! Whew!!! If you have cables (usb)use a piece of tape and write which device it belongs to so later when it’s mixed in a drawer with others you know where it belongs. Cleaning tip: declutter first, then do a little bit each day! I love to clean out closets and send clothes that do not fit to donation stations but also to consignment sales! Then I can tackle the other spring cleaning projects. My besdt spring cleaning tip — OPEN THE WINDOWS! Let Fresh Air In. Then start with one roon at a time. May not get everything done in a day or weekend even, but one room is a good start. Would love to win the washer and dryer. Have never been to Metro, but have heard good things about them. We use Metro for our appliances! They offer great selection! I love Metro Appliances because they are locally owned and have all the best brands and quality. Almost all of my appliances were purchased there. They are friendly with great service too. My best spring cleaning tip…containers…lots of it!!! place items in their own bins!! My best spring cleaning tip…just do a little bit at a time. If you start in one room and just spend an hour each day, you’ll see progress and you won’t get burned out too quick. It may take all spring to finish, but once you get the bug, it’s hard to stop organizing. Spring Cleaning Tip: Have a yard sale and clear the clutter!! It’s well worth your time and energy! To help with clean-ups, use inexpensive coffee filters, i.e., clean windows, mirrors, and chrome… Coffee filters are lint-free so they’ll leave windows sparkling. Cover dishes in microwave to prevent splatters, use as spoon rest during cooking, line flowerpots to prevent soil leaking out,etc. Every spring I go through my closet and get rid of any winter clothes or shoes that went unworn this year. Also I trade out all my warm, winter candles for fresh, spring-scented ones so that even if my house hasn’t had its spring cleaning, it will smell like it! I’m always so ready to do spring cleaning. Of course it takes days or weeks for me to get it all done. I like to really get started on a sunny breezy day, open the windows and turn on the music that always gets me energized and ready to go. Also, remember do a little everyday and don’t get overwhelmed with all your “projects” it all will get done! We have purchased every appliance in our home over the past 10 years from Metro Builders. They have great prices and their Customer Service is second to none! Spring Cleaning Tip: Open up the windows and let the fresh air in! Cleaning the windows is on the top of my to do list every spring. Metro is always so helpful when you are looking for new appliances they are a wealth of knowledge! I could so use a new washer and dryer! I have never been to Metro, but would truly love a new washer and dryer. My cleaning tip for windows and mirrors is newspaper! Spray your window cleaner and wipe clean with the newspaper! It leaves no streaks! My tip for spring cleaning is to gather clutter, junk, old toys and have a garage sale! My daughter loved it when we had one because she got to help “sell” and then we did something special as a family with the money. I also love to open the windows and air out the house while I am dusting and listening to loud music with the kids! Spring cleaning 101: Get those carpets shampooed as this is the time of the year for more company coming over!!!! Music makes Spring Cleaning much more fun! Decluttering is huge when cleaning. Who want’s to clean around junk??? The best spring cleaning tip I have is to go to the hardest place or most dreaded area first to clean… Do this first and the rest will be cake… Also, if u haven’t used it since last year someone else needs it. Less is better!!! I will never have less laundry though so this would be great! Haven’t been there yet, but excited to go! My best spring cleaning tip: If you have the faux wood blinds, take them completely off and outside where you can scrub them down and hose them off. Mine look almost new every time I do! I love Metro Appliance in Springdale they are always very helpful and I love that they continue to support this webiste of Mom’s. Thank you Motherloade and Metro Appliance. . hope I win. Great place to shop for great deals! My tip for spring cleaning is make a punch list for each room. Just work in one room at a time. Don’t get distracted…remember your list and mark off one thing at a time. Before you know it you’ll be ready to move to the next room and your new list. I don’t have a tip for spring cleaning, but sure could use some. I would love to win this washer & dryer set, since every time I do spring cleaning, I like to wash my large comforter on our queen bed, but it is to large for my washer & dryer, would be wonderful to have these! My tip is to reduce, reduce, reduce–get rid of the outgrown clothes, broken toys, etcetera, that have accumulated over the year. It makes summer cleaning a breeze! My best spring cleaning tip is to declutter and get rid of/donate things you don’t use or need. Everything you own, owns a little part of you. Less is more! My best spring cleaning tip is to declutter and get rid of/donate anything you don’t need or use. Everything you own, owns a little part of you! Less is more! I love Metro. They have a great selection, good prices and friendly, helpful employees. When my home was built Metro put all the new appliances they were helpful to give us the best price! I keep a To Do list all year round of projects I want to do when I have time. One of the spring cleaning must is windows and blinds which I hate. Thanks to cleaning plans like motivatedmoms.com or flylady.net, I don’t have to worry about Spring cleaning ever again. I do little things each day through out the year and my home stays company ready. My best spring cleaning advice would be to clean out your closets. I always like to go through my winter clothes and get rid of stuff and then organize all of my spring and summer clothes. I use pledge on my mirrors to prevent them from showing fingerprints and to stop them from fogging up in the bathroom! I keep a to do list year around. Usually, we clean from the bottom. Think about it! I’d say it’s a true statement! So one of the most effective ways I spring clean is to start from the ceiling and work my way down. So I start above my head, i.e. in the closets — go through clothes and figure out what we don’t *really* wear anymore, then I go through the linens, then through the pantry and food cabinets. All the while, I am dusting all the shelves and lights. Of course, if there are cobwebs that need to be dusted up, I’ll take care of those then. The next step is to clean at eye level, i.e. vacuum out the couches and chairs, and polish the dining room chairs, dust all furniture surfaces. Then on to foot level, i.e. where most of the usual cleaning takes place — lower shelves, bathrooms, floors. I love going into Metro just to window shop (if I’m not in for a purchase) because their showroom is HUGE and you can get so many ideas about what your house could look like if/when you remodel. Great prices too; from low to high it’s all nice. Listen to your ipod! I love to listen to podcasts or books while cleaning. Also, don’t forget the batteries in your smoke detector and to change your filters! Metro has everything! We bought the washer and dryer that we’re using now from Metro….but we would love a new set! Getting organized is the best feeling ever! Cleaning out closets, putting winter clothes away and getting out spring/summer clothes is wonderful!! Love Metro! The best selection and best service around. Getting everything organized is the besy way to spring clean. When everything is in its place I feel so much better. If you want to be taken care of go to Metro Appliances & More! They have alot of useful knowledge and really nice appliances. My favorite cleaning tool is a swifter (broom and duster). I don’t have to use much’elbow grease’ when I use them:-) Congrats to however wins! I’d love this great washer & dryer pair with a 4 year old boy & a new baby, we have lots of laundry! As far as Spring cleaning goes, I like to purge old things around the house and donate them to Helping Hands! Jon at Metro is the best. Very nice. Very knowledgeable. Not pushy. He got us a Super Sweet Deal. My spring cleaning tip is to look for a electronic drop off. There is usually one in the spring. Perfect time to get rid of your old electronic. I like the tip above about “40 bags in 40 days”. My biggest problem here is clutter and I think I could actually do what she suggested & help with that! I find that the Mr. Clean Magic Eraser will clean almost anything. Use it to clean your microwave, it works better than anything else- and it will also clean sneakers! That day you get in the mood to clean…do as much as you can! Go through every drawer, cabinet, and closet to free them of unnecessary items. Donate all useable items to charity. My spring cleaning tip is pretty simple and fun – I find that the best way to get motivated to do a bit of cleaning and freshening up is to find a new focal decor piece (shelf, table, throw pillows or even a quirky vintage lamp you want to show off) and redecorate a room around it. Nothing makes cleaning easier than decorating. I find myself donating bags and bags of old things when I do this. Easy and fun! My best Spring Cleaning tip is to conquer the outside of your house first, such as power washing and leave blowing, so that you see your house every day on the outside all neat and pretty to motivate you to conquer all the inside chores! We love Metro! We have a friend who works there, and has helped us purchase a fridge and dishwasher. Soon we’ll be headed back in to order the next appliances to finish the kitchen. We wouldn’t think of going anywhere else. All the salespeople are so friendly and helpful. The showroom is welcoming. It’s always a positive experience. Thank you! I have purchased several items from Metro and have been very pleased every time with the quality and professional manner which I am treated. I always check there first and reccommend to my friends and Family when a need arrises for items they sell. Metro is a nice showroom and I would recommend anyone to purchase their product there. I have told others about it over the years. I have purchased alot of my appliances there. A new washer and dryer would be great! My spring cleaning tip is when you are done cleaning everything out, donate to good will. It is very easy. You just pull up and they come out and take your bags or boxes or whatever you have. It takes no time at all. Our refrigerator gave out last year after 17 Yrs. We shopped all around but found the best to meet our needs at Metro. I love my fridge and am so thankful for it! It would be wonderful to replace my 18 yr. old washer & dryer!! Oh my goodness my washer is squeaking and it takes (3) times for my dryer to dry!! This would bless my family!! Fingers and Toes are crossed!! Cleaning Blinds just use your upholstery attachment to your vacuum and vacuum dust right away!! Baseboards and doors “magic eraser” it make them sparkling white also works for crayon and any other markings! Spring cleaning 101…call my Mother and invite her to visit!!! She loves to help me and loves to clean, I missed that desire somewhere! I havn’t been to Metro yet, but my spring cleaning tip for the linen closet is to fold your fitted sheets and pillow cases and place into the folded flat sheet. Makes it nice just to reach in and grab exactly what you need. I’ve not been to Metro yet, none in my area, but my spring cleaning tip is, I love to use my steam cleaner to clean my window tray’s that get a lil moldy from condinsation during the winter. My best Spring Cleaning tip is to never let it get to a Spring Cleaning.LOL! But, we all know it is not always possible. I have severe asthma and 2 children with Autism. I have to leave the dusting up to someone else. When things are finally dusted, I have to put a fan in the window to blow the floating dust out. It helps a ton, but I still end up in the ER before everything is done. I do several loads of laundry a day. I really could use these dryers!!! It would help us more then you could ever know. My best spring cleaning tip is do it all year long. Then when “spring” comes, it’s not such a big task. I heard a great spring cleaning tip from my grandma the other day that I would love to share. Every February/March you should go through all your drawers and declutter them. (especially those junk drawers). Happy decluttering. Spring cleaning tip: Have great music to listen to. I attempt to be prove myself a planner by taking down the curtins for cleaning at the same time I clean the blinds. My Spring cleaning tip: To organize the sheet sets (and keep them from fresh) put the set in one of the zippered plastic blanket “thingys” that your new blanket come in. Using bleach cleaning wipes always helps save time in the bathrooms and kitchen! Oh I would love to win this. Never been to Metro, but my best spring cleaning tip is to make a schedule! declutter as part of spring cleaning. Get rid of stuff you don’t need. Yay!! I love Metro! They’re super nice and they ROCK for doing these giveaways! Thank you! Clean or straighten your house around 4 each day. This is when I hear the most productive cleaning will get done. I love going to see the new stuff in the showroom at Metro. It’s like looking in home decorating magazines. I’ve been going there since 1998 and have loved them ever since! I like to do my “spring cleaning” in the winter so I can play outside in the Spring! The washer and dryer are amazing! I like to save my “Spring Cleaning” for the rainy days and play outside on pretty days so that I don’t feel like I’m missing out on anything. I like to do my spring cleaning with the windows opened. That way I get the house aired out while I’m cleaning. After our kids moved out (empty nesters) I decided less was more! I decluttered the entire house and even the attic! Makes cleaning SO much easier! My best spring cleaning tip is to start with the least unorganized room. That way you will see success and it will encourage to go on to the next room. Start small and work to the big projects! FOLLOW THE LIGHT: Many people hate cleaning windows and light fixtures, but … I have found, in my 54 years, that if you do it first, it brightens and lightens so that you SEE what needs to be cleaned – and, if the hard part is over, it’s easier to do the simpler tasks. Also, a bit of vinegar in the dishwasher (yep, just pour it in) will make the light fixtures sparkle (IF they fit on the top rack – wouldn’t trust the bottom too much). 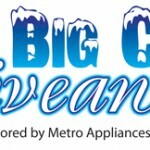 AND … get your dishwasher from METRO APPLIANCE & MORE! 1) Go thru your stuff each season. Keep only what you really need/use. 2) If you don’t have much storage, place larger blankets, coats,etc. in vacuum plastic bags which can be easily stored under the bed, at the top of a closet or ottoman that allows for storage. 3) Purchase a front loading washer and dryer from Metro Appliance and More to easily wash bedspreads, curtains, linens and MORE! WOW! A new washer/dryer…pick me…pick me!!! I like to make a list of jobs: vacuuming, bathrooms, sweeping, mopping, etc. and then get that job done in all areas and move on to the next thing. I think it helps to break up spring cleaning into manageable lists. Think of what you need to clean in each area of the house and then make a Kitchen list, Bathroom list, Bedroom list, Dining Room list and Living Areas list. Once you can break up each area you can take a little time each day to get them done and then mark them off. As your mark offs increase, it gives you a great sense of accomplishment as well as a thorough cleaning. I don’t really do a ‘spring cleaning’ The week after school starts and the week after Christmas Break are my big cleaning and reorganizing times. I start by making a list of what I want to accomplish each day. Then, I don’t find myself wandering around trying to decide what to do next. It keeps me focused, and marking things off the list boosts my motivation to get more finished! I love metro we purchased out refrigerator from there when we built out home! They are really friendly and not to pushy! I would love this set my dryer is like 20 years old really it is that horrible yellow color but if it isn’t broke don’t replace it! Well unless I win this fabulous set!! This is an AWESOME giveaway! Thank you so much for having these giveaways NWA Motherlode. Honestly, I’m not good with regular cleaning at my house but I would have to say my Spring Cleaning tip would be my Hyla vacuum cleaner. I LOVE it! It was worth every penny. Our lovely dogs love to shed their entire coat off in our house and that vacuum saves the day! I (of course) vacuum with it but I also dust with it as well. I also couldn’t live without the Clorox wipes! They save the day when it comes to cleaning my bathroom and kitchen! Good luck to everyone with the Spring Cleaning! I don’t know if anyone’s already posted this one (since there are 197 comments!!) but my tip is to leave a jar of Lysol/Clorox wipes in several rooms throughout the house for a quick spot clean in-between big cleanings. You’re more likely to do it right then if the jar is already in the room rather than having to go track it down! We loved to shop metro! All the best appliances in one place! The staff was soooooo helpful and friendly!!! We ended up buying several items from Metro! What an awesome store!!!! I have son who plays baseball. A good tip I learned to get white baseball pants clean is pour some Cascade with Bleach dishwasher detergent on the stains and throw in the washer with other white clothes using normal laundry soap. I have shopped at Metro and love that place! I really like the customer service you get when you are there. I have worked for two construction companies over the past 16 years. Both companies bought all appliances from Metro because of their high quality and excellent service. Cheap, thin cloth diapers make the best dust rags. I’ve only been to Metro once, but the kitchen showroom was pretty impressive. Cleaning fun…. I have a honey do list for spring cleaning and trying to do a little all year long. Their knowledge on appliances is unbeatable in the area, very trustworthy. Make a chore list and get eveyone involved…declutter your house faster when you get the whold family moving in the same direction. I LOVED this idea because I’m a first time expecting mother who loves organization. When organizing my baby boy’s closet I was having a hard time organizing all the different sizes of clothing on hangers. Another mother suggested to me to put dividers (like in department stores) between the different sizes to distinguish easily where they were! I LOVE the ease of being able to see how much of what size/season we have. Maybe not a “spring cleaning” tip- but definitely a very helpful organizing tip! We bought our appliances at Metro when we remodeled our kitchen. We loved the large selection and friendly service. We have been very happy with our appliances! Metro is an awesome store! My washer and dryer are very old and I get very frustrated drying clothes because it takes several rounds just to get them dry. A new set would be fabulous! Wonderful give away. Using lemons in a bowl of water to clean the microwave is a good tip. It loosens any caked on food, making it easy to wipe clean without using chemicals, and provides an awesome aroma. Metro is great. Customer service is wonderful and they’re always able to answer my questions. Great giveaway! Lemons and salt make a great cleaner. The salt is a great scrubber for stubborn messes! Thanks Mamas and Metro! This is a Fantabulous Giveaway! What a great giveaway! Spring cleaning tip.. stay on top of cleaning throughout the year so your spring list is small! Best Spring Cleaning Tip is get your kids involved! The little ones usually love to help, great opportunity for them to be responsible and maybe even earn some money. Cheaper than paying a housekeeper, and you can rock the tunes for the whole family to enjoy! Team effort rocks!! I like Metro because they are friendly and knowledgeable and can answer all my questions. Theses people know customer service! Here is a fun Spring Cleaning tip- take off window screens, then spray your windows with 2 parts vinegar to 5 parts water. Use newspaper to dry, you will have streak free windows! With four kids and two still ‘at home'(not school)…I still have a general continuous amount of chaos and clutter, but a few things have helped me feel like I’m tackling it as best I can: first I’ve begun training my 10 and almost 8 yr old to do their own laundry, and after 3 yrs my 10 yr old has total responsibility and is doing it well! Second, I’ve teamed up with the FlyLady website, she suggest one area a week to work on, and one task a day in that area. Third, my kids love flipping their chore clip exclaiming a praise for finishing their job on the cute new burlap chore chart I made last week! I prefer to focus on one room at a time. That way if you don’t get finished with all the housework at least you feel like you got one room accomplished. The staff at Metro is wonderful, and their selection is great! Metro has the best selection of appliances in the area. Their staff know what customer service is all about. I used to compare prices at several retailers, but they just can’t be beat. Now we just start and end at Metro. I use Mrs. Meyer’s cleaning supplies. They smell so good that I immediately feel better and want to clean more. I don’t have a spring cleaning tip, but one of my favorite new organization tips is to put each of your USB cords that you use regularly with your computer (to download pictures from your camera, or sync your ipod) into their own plastic baggie, and then label the bag according to the function of that particular cord. Helps keep the clutter down in your office and helps you to remember what each cord does! They have a huge selection of appliances & their sales staff are very knowledgeable and helpful. Great customer service! I’ve never really purchased anything at metro but everytime we visit to dream about redoing the kitchen etc. they have always been real helpful. For my teenage son I hung a shoe organizer(clear plastic)and placed all his electric cords,game boy,extra keys,belts,and all the other odds and ends that he has. He loves it because he can see thru the organizer and find what he is looking for. i love visiting Metro (haven’t bought anything) but the staff there is very helpful! Spring cleaning tip: out with the old!!!! Get organized and donate everything you don’t use anymore!!! Our dryer is in the process of dying, so I’ll definitely have to go check out Metro! Though it would be great to win the set!! My spring cleaning tip: make a game of it & get kids in on it. We have brought lots of appliances over the years at Metro. Staff always very helpful! My washer and dryer all so old. I will have to check out Metro to see what they have. Would loved to win these new items. My favorite tip is to set up a “dump zone”. For me that means I have a large plastic tub marked “donate” which is located in my pantry next to the garage. On any given day I’ll notice items I no longer need or want and will put them in the tub. Once the tub is full or my errands are going to take me near Goodwill I just put the tub in my car and deliver the goods. Just designating a place to put donation items helps me be less cluttered. Spring time means cleaning and the best way to get it done is for everyone to pitch in. I am teaching my son how to do laundry. He is 10 and he actually loves doing the laundry. I have heard good things about Metro so I am excited they are giving away the washer and dryer. The company is doing a great thing! My Spring cleaning tip is to mix white vinegar and water in a spray bottle for cleaning windows, etc. Since it’s safe for the kiddos, they can help clean windows and counters, too! Lemons, candles, and fresh dryer sheets with the windows open – using one or all of these at least makes the house SMELL clean! Love the giveaway, Thank you Metro! Best spring cleaning tip… Start at the top and work your way down! And closets first! I look forward to a day of shopping when I can shop at Metro Appliances & More in Springdale, AR. For the time being I will share a “Spring Cleaning” tip with you, in hopes of being named the 2011 “Spring Cleaning Giveaway” Winner! d. Always get rid of or set a special area in a shop building up to hold the unwanted items for donation or a yard sale. e. realize that cleaning is not moving STUFF from one area to another since you do not know where it should go. DO IT NOW. Give it a HOME!!! I just love shopping at Metro Appliances because of the wonderful selection and the great attention that you get from the staff. Some places that you go in shopping for appliances the staff will really overwhelm you, but not at Metro. They were there to answer all my questions and help me as I needed it but they also gave me my space to look around too. I recently moved into my first home and really need this new set. Metro has great prices and a wide variety of appliances to choose from, friendly staff!! 1) Place a bowl of vinegar out in a room to absorb cigarette odors. 2) Got wet electonics?? Place then in a paper towel and then place in a bag of rice. Both materials will draw out the moisture in your electronics. 4) Clear nail polish will repair small holes in window screens. Try to tackle one room at a time and if there are items that do not belong, take to where they do. What I love best about Metro is the fact that they know what they are talking about, customer service is great. Plus, they try to price match as best they can! I love metro!!! I bought my stove there last year. I loved that it was cheaper to have the stove delivered to me (and only pay county/state tax since I live out of town) than to pick up the stove & pay all the tax! I try to follow some of the flylady tips. Do a little each day and it won’t be a huge job. I would love to win this! I’ve bought several appliances at Metro, and I love their great customer service and good prices! As for Spring Cleaning, I’ll repeat what many others have said…start with a room or closet and complete it before moving on. That way your sense of accomplishment will inspire you to do more! I am excited to visit this website. This is my first time here. I am looking forward to spring cleaning and getting ready for summer! I don’t really have a great spring cleaning tip besides get rid of those clothes you don’t wear any more! I could sure use a new washer/dryer set. My washer is over 9 years old and walks across the floor, squeaks, etc. I have 3 kids and have about 10-12 loads per week. It is crazy! My dryer is a hand-me-down and on its last leg! I love Metro and even if I don’t win, I am going there for my new appliances when I can! I also use Oxy-Clean and Zout for tough stains! things up!! I can’t wait to visit the store, besides washers and dryer, I will be looking at refridgeraters also. Tips for spring cleaning, clean one room a day. Involve your children, have them pick up 3 things at a time to clean. This gets the house clean and helps the kids with their counting skills. Metro has a huge selection of appliances to choose from. The staff is very knowledgeable and friendly. Spring cleaning tip: Take it one step at a time, to avoid becoming overwhelmed! Take an old tshirt and pin it around a straw broom and use it to dust around the crown molding and corners of the ceiling. No need for a ladder! Please consider letting me win this set. I have 5 children that age from 12-1year. So laundry is something I can never get done. And the worst part is my washer has gone out and my dryer isn’t drying very good. And my husband is out of work. Please think about blessing my family of 7 with this. We would be so very grateful. My best spring cleaning tip is to try on all my last year summer clothing. Anything I haven’t worn in a year I donate to Goodwill. Same with shoes. I’ve not been to Metro but NEED new a washer and dryer set badly. (Celebrate 30 years the 11th:) Spring cleaning tip: Set your timer and do a little each day. I’ve never been to Metro but would love to have the pedestal washer and dryer. My daughter has a set and they are wonderful. Spring Cleaning Tip: Open the windows and let the fresh air in while you are cleaning. Do only one room at a time and leave the floor cleaning until last. I love the Metro store because they have great seleotions and the folks there are SOO nice!! I do have to say that I really enjoy listening to you ladies on 107.9 and laugh when you give Guy a hard time!! Thanks for having this awesome website!! I love this time of year because I can open all of the windows and get the old air out of the house. It is also nice to clean in this weather because everything smells so good. Hi. I have not had a chance yet to go to the metro showroom, but since I am shopping for a new refrigerator, I asked several friends for recommendations. Their name kept coming up as having great prices and good service. Hopefully I will have a chance to get by and view there soon. Always great service from great people!!! I read through a few of the commits, and one remains on my mind. Rebecka with five children and her husband out of work. Please bless her with the washer and dryer and if not whoever wins the washer and dryer bless her with your old ones. I love Mr. Clean magic erasers for cleaning the baseboards. They are amazing at removing scuff marks. If you are like me and have a bunch of clothes and you have no idea what you really wear and don’t wear…flip the hangers the wrong way on everything, then flip them back as you wear each thing. Whatever you don’t wear by the end of the season-donate it! I went to Metro yesterday while The Mamas were there. There was absolutely no pressure! The sales lady explained the sale and told me to let her know if I needed anything. I enjoyed looking at the beautiful kitchens. I was especially intrigued by the refrigerator with the computer screen that allows you to see nutritional values for food. I will definitely visit Metro when I am in the market to remodel my kitchen. My Spring Cleaning Tip, make sure to trim all unwanted vines clinging to your house, ants love to use these as a super highway to your house. My cleaning tip is to divide your house into “areas” and then clean and sort using giant garbage bags to get rid of clutter and junk. I have been to Metro once in the last year. I was unable to purchase anything at that time but the salesperson was very friendly and did not mind showing me around. They have topnotch customer service. I would love to win these! My husband and I have had the same washer & dryer since we have been married almost 13 years ago and that set we bought used! I love shopping at Metro . Went to metro this weekend looking for a fridge great staff and service I would reccomend to anyone. Also, if I were to win these, I would give them to my sister & brother-in-law who just had twin girls! Their old washer & dryer doesn’t work a lot of the time and they got it off of Craigslist, but they don’t have any money to get a new one with having expenses from AR Children’s Hospital after their girls were born! Their girls are now 2 months old and are doing great, but they have a TON of laundry, lol!